Would YOU pay any attention to that post? Even if you were an engineer, why would that post make you want to work at Cisco? If you’re any good, you have your pick of placements. What about that post would incentivize you to click? The answer is nothing. And our metrics showed it. We even had a talent brand consultant come in and give us a brutal dose of honesty: the social efforts were stinking up the joint, and bringing to light an outdated view of talent brand. 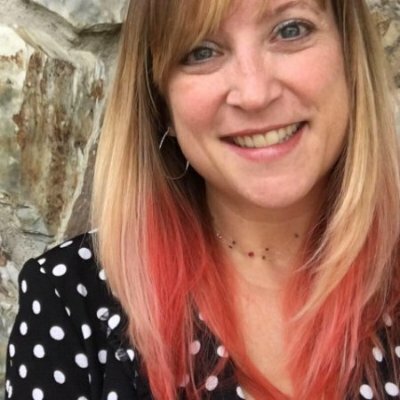 As the social media manager for the talent brand team within the Talent Acquisition and HR organization at Cisco, that stung. After our reality check, my new manager asked me if I’d survived the attack on the channels I was charged with. No matter about the personal affect it had on me, I told her that the consultant was right. However I felt like my hands were tied, because sometimes, what a company has always done is the only thing you’re allowed to keep doing. So we changed our employment branding strategy, and our new manager untied our hands. We were going to change, and go fast. Learn along the way. We started with a mission statement. We thought the employer brand for Cisco hinged on the idea of “personal connections” amongst our employees, with future talent and with our technology. Technology without an impact on people is meaningless, and especially in social, it’s all about the human element. This was a perfect match with Our People Deal, which was created a few months earlier. Directed by our Chief People Officer, Our People Deal was a declaration of the importance of employees, what Cisco expected from them, but also what they could expect from us. Our talent brand team interpreted that as a people-first philosophy. It was like our mission of personal connections was supported top-down. 1. Gave our social channels a human voice – we got real. What I mean by “real” is that we stopped posting like we were a 70K+ person company, and we started posting like we were 70K+ people working for the company. What’s the difference? Our voice. It’s not corporate – I call it our “co-worker” tone. There are real people at Cisco doing “real” cool stuff with real results, amplified by the real people running the social media channels. The example I like to use is “the elevator.” When you get on an elevator with someone else, usually you’d first say “hi.” Then you’d maybe introduce yourself, but then ask, “what about you?” It’s a conversation, it’s not you getting on an elevator and talking at someone for 30 seconds. That makes you more of a robot, less of a human. 2. We put our best advocates – our employees – first. 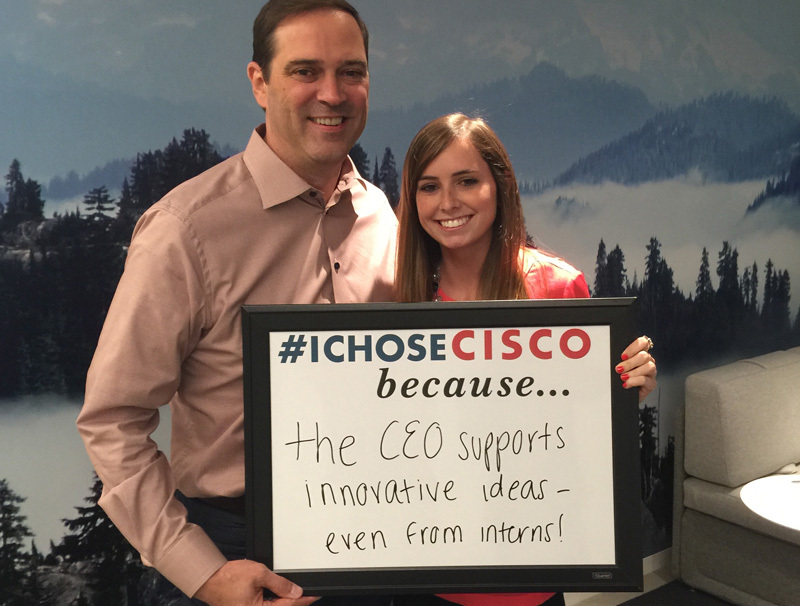 Who is best positioned to tell others why Cisco is a great place to work? The people who work here. Edelman’s Trust Survey gives us the hard numbers. What makes someone buy (or in this case, “buy in” to an idea) is determined largely by what people in his or her network say. In fact, people are 90% more likely to trust their network than a brand. This meant that I could post on social until the cows come home about how many awards Cisco wins, how great it is to work here, etc. But I’m a brand – people don’t trust my self-promotion. As we shook things up and adopted the voice of a “co-worker,” we upped our trust barometer reading. And then took it a step further. 3. We started a recruiting blog focusing on our employees. Where could we tell our stories? As much fun as is it to write in 140 characters, we needed to highlight more of the employee voice, with links and extra information on why work at Cisco and how to apply. Content is the key to any great talent brand, and we thought a blog would be a great place to do this. Plus, we’d be doing things differently – only 9% of the Fortune 500 have a “talent” blog. We worked with the Cisco blog platform to create a unique instance of a “recruiting blog” – where we talk about career and resume tips, but mostly about employees. Now, we are generating content that the other Cisco channels were excited to amplify and share, rather than the other way around. 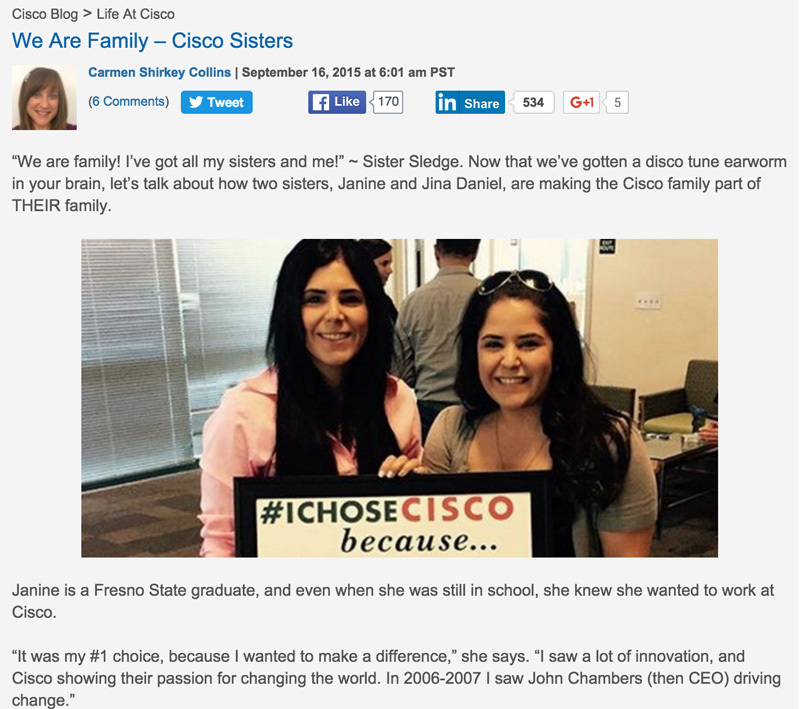 Each month, between 2-3 posts from the blog are in the top 10 most shared on Cisco blogs. Our Klout score has risen, as we position ourselves as content creators and thought leaders on employee experience. 4. We encouraged the conversation. There had never been a clear way for employees to come together as a tribe and share their experiences on social media. We started encouraging the usage of a select few company-wide hashtags to “corral” the conversation. 2016 will see more consolidation of hashtags, specifically around #WeAreCisco, but combined with stronger talent branded hashtags, like #LoveWhereYouWork. 5. We showed we can have fun. While staying true to the Cisco brand voice, we all agreed that the talent brand was a subset brand and needed its own nuances. One nuance that we developed was the idea of fun. That doesn’t mean that we were all fun all the time. Our employees do some serious work, but when you spend half your life with the people you work with, if you can’t have a little fun, what’s the point? 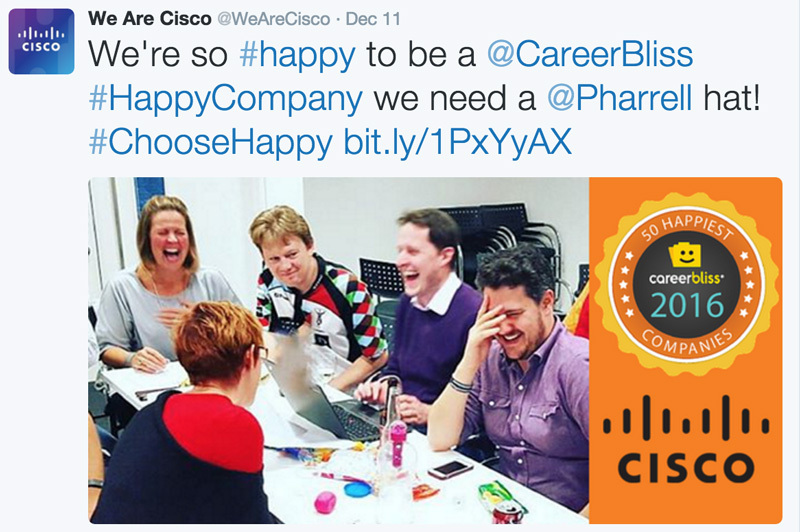 We even got named a “happy workplace” by Career Bliss for 2015 – so we posted a photo of employees laughing, and gave a nod to the master of “Happy” - Pharrell. The social comments were all about the visual – how it looked like we truly were a happy place. Not only did we tell the world about the award (the “all about us” way) we SHOWED it with an authentic photo. The result? We flew high. Remember that my manger said fly or fail forward? Turns out, we flew. We grew our Twitter followers by 400% in 6 months. We launched an Instagram account and earned 2K followers with above-industry engagement in those same 6 months. We landed on LinkedIn’s InDemand employers in North America list for the first time at #26. We topped Resume Library’s HR Power 100 list, leapfrogging 140 spots. Twitter verified our account, as did Facebook and Instagram. And, we’re driving traffic to our jobs site, which is the most important thing. Additionally, we trained our recruiter base. One recruiter sent the talent brand team an email that said if we had told her three months ago that social would impact her quality of hire and time to hire, she’d have laughed us out of the room. Once you fly, you want to go higher. Big things are in store for 2016. Follow along.